^ Jeroen Temperman. State Religion Relationships and Human Rights Law. Martinus Nijhoff Publishers. http://books.google.com/books?id=Khag6tbsIn4C&pg=PA88&dq=flag+of+sweden+christian&hl=en&ei=S3tGTZrYAcqr8AbOqcWgDg&sa=X&oi=book_result&ct=result&resnum=4&ved=0CFAQ6AEwAzgK#v=onepage&q=flag%20of%20sweden%20christian&f=false 2007年12月31日閲覧. "Many predominantly Christian states show a cross, symbolising Christainity, on their national flag. Scandinavian crosses or Nordic crosses on the flags of the Nordic countries–Denmark, Finland, Iceland, Norway and Sweden–also represent Christianity." ^ Carol A. Foley. The Australian Flag: Colonial Relic or Contemporary Icon. William Gaunt & Sons. http://books.google.com/books?id=WV7ag4EpHF8C&pg=PA10&dq=sweden+flag+cross+christian&hl=en&ei=ZX5GTcO3MIH58Abcq6jqAQ&sa=X&oi=book_result&ct=result&resnum=8&ved=0CGkQ6AEwBw#v=onepage&q=sweden%20flag%20cross%20christian&f=false 2007年12月31日閲覧. "The Christian cross, for instance, is one of the oldest and most widely used symbols in the world, and many European countries, such as the United Kingdom, Norway, Sweden, Finland, Denmark, Iceland, Greece and Switzerland, adopted and currently retain the Christian cross on their national flags." 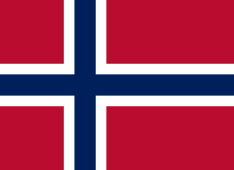 ^ Munksgaard, Jan Henrik: "Et nytt flagg for Norge 1814-1821", In: Nordisk flaggkontakt, Vol. 40, 2005, pp.19-30.